Home of one of the Maldives’ two major cities, Addu Atoll's colorful corals dot the horizon. Addu Atoll boasts some of the Maldives' best locations for water sports, such as Maa Kandu. Addu Atoll also contains excellent spa and resort centers. A variety of venues offer exquisite ocean-side villas and retreats, many of which hover over the shores in island fashion. The Shangri-La's Villingili Resort & Spa is perhaps Addu Atoll's most exquisite wedding venue and offers competitive wedding packages deemed as a "fairytale beginning". Ari Atoll is the perfect atoll for scuba diving adventures. 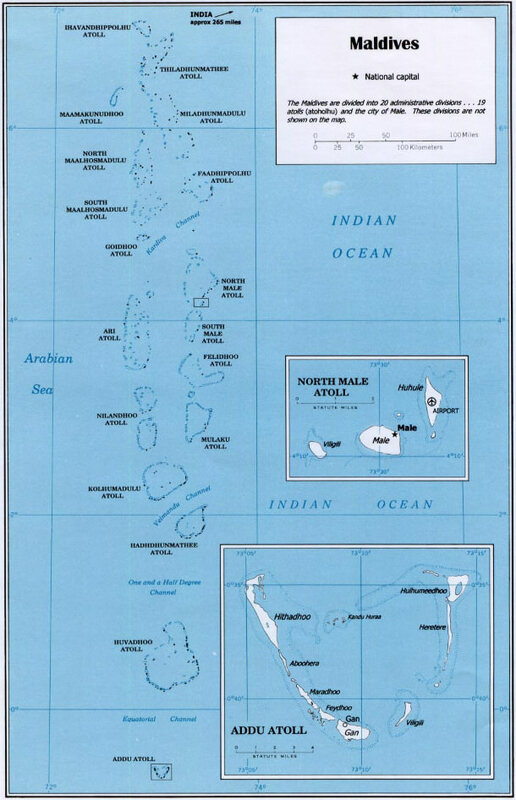 World renowned diving locations, like Fish Head, are clustered around this atoll. A variety of reefs surround this atoll, making it an excellent location for a diver or snorkeler of any level. Activities aside, Ari Atoll possesses excellent lodging and services that will make your destination wedding worthwhile. Multiple venues like Lux Resorts and Constance Moofushi offer wedding services within their luxurious establishments. Etthingili Alifushi Atoll definitely has more of an island retreat-like feel. With only Alifushi Atoll inhabited, anyone longing for silence will enjoy their stay here. The sheer serenity has the capacity to host a brilliant wedding ceremony. Adaaran Select Meedhupparu has that island charm with modern facilities. This luxury hotel offers an array of excursions such as night fishing, cruises, and island picnics. See http://www.adaaran.com/selectmeedhupparu for more on this fine hotel. Fantastic beaches like Komodo Beach line the shore of Faadhippolhu Atoll. The serene coast of Faadhippolhu is perfect for your wedding in the Maldives. Numerous diving spots with extensive reefs and various resorts can be found on Faadhippolhu. Some resorts that can be found on this atoll include the Palm Beach Resort & Spa, Komodo Maldives Island Resort, and Kuredo Island Resort. Fasdhuethere is positioned between other atolls which makes it an excellent location to soak in the beauty of the Maldives. This atoll is impeccably desolate, with the only inhabited island being Kudarikilu Island. Island hopping is a realistic and exciting possibility here. The isolated nature of Fasdhuethere gives it that off-the-grid appeal that many long for. Anantara Kihavah Villas boasts underwater dining facilities, private villas, and beach-front wedding services. See http://kihavah-maldives.anantara.com/wedding.aspx for more information on this venue. Pristine and largely undeveloped, this atoll is home to internationally renowned dive sites. One of which, Fotteyo Kandu, is regarded as the world's best. Felidhe Atoll is mostly desolate and is the perfect atoll for recreational outings. Not many venues or resorts can be found on Felidhe Atoll, however that doesn't take away the sheer beauty of the atoll. You can easily lodge on a nearby atoll and take transportation to Felidhe Atoll for the ceremony or outings. Fuvahmulah has a welcoming population with stretches of white sand beaches and tropical vegetation. This atoll is also one of the largest in the Maldives, and chances are you can fly directly here as it boasts its own airport. The atoll contains several options for lodging and wedding services. Viluxer Retreat Maldives offers opulent western style lodging with a variety of packages. Guided snorkeling, cruises, and beautiful hikes are some of the excursions they offer. Gahaaafaru is a relatively small atoll with a quaint charm. A huge luscious reef surrounds the atoll, making it historically hard to access. Although this atoll does not have much accommodation, many nearby atolls do and as such will accommodate you if you'd like to have your wedding on the pristine shores of Gahaafaru Atoll. Three of the seven islands that compose this stunning atoll are inhabited. There are plenty of opportunities to go snorkeling, diving, and even mingle with the local community here. Azoush Tourist Guest House is located on the island of Fulhadoo. With plenty of excursions and wedding possibilities, the Azoush Tourist Guest House is a great option for anyone considering a wedding on this atoll. With a population of over 14,000 people, Haddhunmathi has one of the largest communities of the Maldives. Your wedding here will be filled with beauty and an unlimited amount of excursions. The Six Senses Latitude Laamu offers five different types of villas, all extraordinarily fit for the beauty of the atoll. Spa services, dining, and excursions are available. See http://www.sixsenses.com/resorts/laamu for more information on this great venue in Haddhunmathi. As the second largest atoll, Huvadhu has an amazing array of venues to choose from. The shores of Hubadhu are pure and vast, extending over white sand. The luxurious villas and resorts of Huvadhu can be pricey, but the budget conscious will also find options here. The Robinson's villas are almost otherworldly and come in several options ranging from beach to ocean front. There is extensive dining services and various activities to choose from. See http://www.robinson-maldives.com/ for more on this venue. Ihavandhippolhu is the northernmost atoll of the Maldives. Scenic corals line the atoll, giving the adventurous amazing diving opportunities here. The islands of this atoll are small and have that private island feeling. A major resort on Ihavandhippolhu is the Beach House Irulevi. The resort prides itself on being located in the beautiful Northern Maldives. Numerous recreational facilities are located at the Beach House Irulevi, including a 5 star diving center. Kaashidhu is largely vegetated and known for its many coconut trees. This ancient atoll contains remnants of Buddhist monasteries from the 7-8th centuries. The Huvafen Fushi Resort is the perfect venue for a wedding in the Maldives. Some of the more unique packages include a "Dream Dhoni" wedding package, which includes an overnight stay on a Maldivian Dhoni boat, photography, and a sunrise cruise. See http://huvafenfushi.peraquum.com/weddings/ for more information on these packages. Recreational fishing is huge at Kolhumadulu. This atoll is also home to some of the Maldives most ancient Buddhist remains. The waters of Kolhumadulu are impeccably tranquil and welcoming. Any couple would appreciate a wedding at this atoll. Maalifushi By Como is nestled in the island of Maalifushi among a chain of uninhabited islands. The sheer variety of villas and packages that Maalifushi By Como offers is incredible. See http://www.comohotels.com/maalifushi/maalifushi for more information on this venue. Maalhosmadulu Dhekunuburi is an unforgettable atoll that boasts some of the Maldives best scenery. The corals at this atoll can be more shallow and thus is great for children and beginner snorkelers. Olhugiri is a famous diving site in the Maldives and is located in this atoll. Many islands makeup Maalhosmadulu Dhekunuburi, and island hopping is a fun excursion. Reethi Beach Resort, Four Seasons Resort Maldives at Landaa Giraavaru, and Royal Island Resort & Spa are some excellent venues at this atoll. Formerly restricted to locals, since opening its gates tourists have flocked to this gem of the Maldives. This atoll has prime access to magnificent beaches and coral patches. Enjoy the calm currents of this atoll by sailing or jet-skiing across the azure waters. A few of the great venues in this atoll include Adaaran Select Meedhupparu, Meedhupparu Island Resort and Adaaran Prestige Water Villas. Maamakunudhoo is a historical atoll with many shipwrecks surrounding the abundant coral reef. This atoll is small and is the perfect location for an intimate getaway. Makunudu Island Resort is one of several resorts in the atoll that has excellent service. The venue has windsurfing, water-skiing, diving, and snorkeling services. See http://www.makunudu.com/island.html for more information. With over 50 islands and the Maldives' most populated city, Male'atholhu Dhekunuburi presents visitors with an endless amount of things to see. Mosques, markets, museums, great resorts, and a plethora of activities makeup much of this atoll. Baros Maldives is continually rated as a top resort of Male'atholhu Dhekunuburi Atoll. Brilliant views surround the villas at Baros. Diving, traditional sailing, canoeing, and anything you could desire are available here. Palm trees shade the white sand beaches of this atoll, making it a true island paradise. This atoll is unique because from March to October it's a surfing zone. Deep sea fishing is another activity that's common here. As a major hub of the Maldives, island hopping is much easier from this and other Male locations. Resorts can be on the higher end of the scale in this region as it is in high demand. The Helengeli Island Resort offers great lodging for competitive pricing. Snorkel safaris, diving, and spa outings are great activities here. See http://www.helengeli.net/ for more information on this venue. Mulak is fairly isolated which gives it that island escape-like feeling. A huge barrier reef in semi-shallow water stretches over much of the coast. The Medhufushi Island Resort is surrounded by a natural lagoon. All villas feature modern amenities. The resort also offers a competitive wedding package. See http://www.aaaresorts.com.mv/Medhufushi/ for more information. Azure waters and white sand hover below the resorts of Nilandhe Atholu Dhekununburi. This atoll is a prime location for relaxation. It's serene beauty would make it a fantastic destination for anyone. Velavaru Island Resort is this atoll's top venue. There are plenty of romantic getaway packages that will help you make the most out of this special time. See http://www.angsana.com/ for more information. This historical atoll, also known as Faafu, contains 5 inhabited islands. There is a decent sized local community which includes historical mosques. Faafu also contains one of the most exclusive island residences in the Maldives. The Rania Experience comes with a private yacht and the quaint island of Maafushi for the duration of stay. Filitheyo Island Resort might not be as exclusive as the Rania Experience, but its breathtaking villas are priceless. The venue also caters to weddings. See http://www.aaaresorts.com.mv/Filitheyo/ for more information on this venue. Rasdhu is an atoll that anyone would love. Caves, shipwrecks, prime diving sites, and great resorts are why so many appreciate Rasdhu Atoll. The Kuramathi House Reef is a fantastic spot for casual snorkeling. For the daring, Rasdhoo Madivaru frequently hosts manta ray, turtles, and even sharks. Even better is that all of this can be experienced in close proximity from an excellent selection of venues, such as the Hotel Kuramanthi Island Resort. Over 40 exquisite islands makeup the Thiladhunmathi Atoll. This atoll has excellent coral reefs and is a snorkelers paradise. Resorts are limited, but a few such as the Vilu Reef Beach & Spa Resort offer optimal service. Choose from multiple villas and suites, and indulge in exquisite spa services. What better way to say "I do" than under a Maldivian sunset. The resort offers a sunset wedding package that will make your destination wedding in Thiladhunmathi Atoll excellent. See http://www.vilureefmaldives.com/ for more information on this venue. Thoddu Atoll has some of the deepest waters of the Maldives surrounding its shores, which make it an excellent location for experienced divers. The gorgeous Thoddu Beach is one of the main reasons this atoll is visited so frequently. Resorts or modern amenities are hard to come by on Thoddu. A few locals have set up vacation homes for the tourists that come into Thoddu Atoll. This atoll would also make an excellent island hopping destination. Vattaru is known as the "quiet" atoll as it's uninhabited and tourists aren't typically found here. There are prime sites for diving and snorkeling, as well as sightseeing on its shore. The desolate nature of this atoll would make a great photo opportunity or even a quick getaway for you and guests alike. Consider staying at a nearby venue such as the Taj Exotica Resort & Spa or the Park Hyatt Maldives for quick access to Vattaru Atolls righteousness. You can find out more about getting married in the Maldives in our Maldives Wedding Guide or visit our Maldives Wedding Directory to start planning your dream wedding.